Exciting times! We have a cornucopia of events and collaborations coming up in June and July, we’ve stared establishing co-operative practices and handing-over jobs, we submitted a residency application to MayDay Rooms to research and develop our educational programme and we’re submitting a workshop proposal for V22 Summer Club. 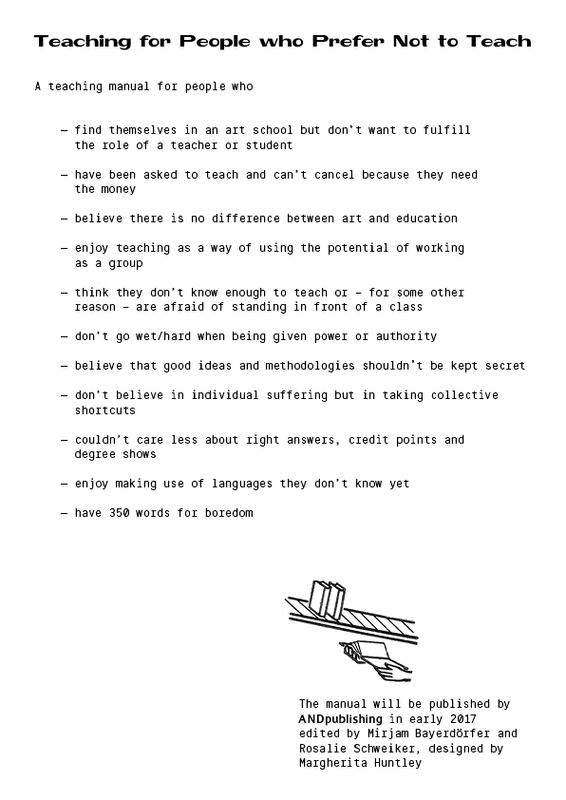 On 22 May we attended a talk by Rosalie Schweiker, the latest event in AltMFA’s Future Programme supported with funding from A-N. Rosalie and designer Margherita Huntley presented their forthcoming booklet titled Teaching for people who prefer not to teach. 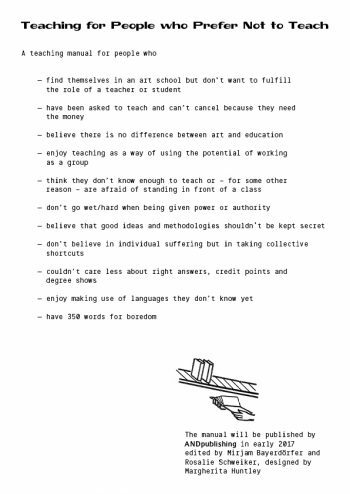 Inspired by the controversial Little Red Schoolbook, Teaching for people who prefer not to teach is a collection of resources for zero-hours educators, it questions current teaching practices in art education, introducing collectivity, humour, experimentation and invisible labour. Rosalie also talked about her work policy, work experiences and collaborations with other artists, everyone shared their own experiences and we discussed precarity, exploitation, making good decisions and having boundaries. We also heard about the history of AltMFA, how it is organised and what problems they’ve encountered. This Friday, 9 June we’re discussing The Dismeasure of Art, an interview with Paolo Virno at Cafe Tropics in Elephant & Castle. This event will be chaired by Rubén Salgado Perez and if the weather is good we will be sitting outside, followed at 8pm by a live band! The [ARTCRAWL] is coming up on Saturday, 24 June. This month we’re venturing off the beaten path to visit and discuss exhibitions at the Freud Museum and Furtherfield, with a stop at Thomas Dane on the way. In July we’re planning a joint workshop together with AltMFA and we’re going on an excursion to visit TOMA in Southend-on-Sea. Please stay tuned for more information. Kinki Club, Bologna. Spaghetti Disco, Red Gallery, London, Oct 2016. Photo by Graziella Ronchi. Poster for Sharing Diverse Practices on Common Ground, 10 June 2017 (detail), by Rachel Ara. Anonymous. Rechthoekige cartouche, 16th century. Photo by Paul K, 2008.